Offering companies interested and involved in the nuclear industry multiple opportunities for networking and education. Tuesday, October 2: To start the week off, the East Tennessee Economic Council (ETEC) will host their 2nd annual Nuclear Suppliers Workshop (NSW). This one-day conference will be held at Oak Ridge National Laboratory and will feature sessions conducted by national speakers representing various components of the nuclear industry geared toward strengthening the nation’s nuclear supply chain. The event will conclude with an evening reception open to both NSW and Molten Salt Reactor Workshop attendees. Tuesday, October 2- Thursday, October 4: ETEBA, Energy Technology and Environmental Business Association, will host their annual Business Opportunities and Technical Conference at the Knoxville Convention Center. This event focuses on linking businesses with opportunities across the energy, technology, and environmental supply chain. Receptions will be held on Tuesday and Wednesday evenings with content and vendor booths available on Wednesday and Thursday. 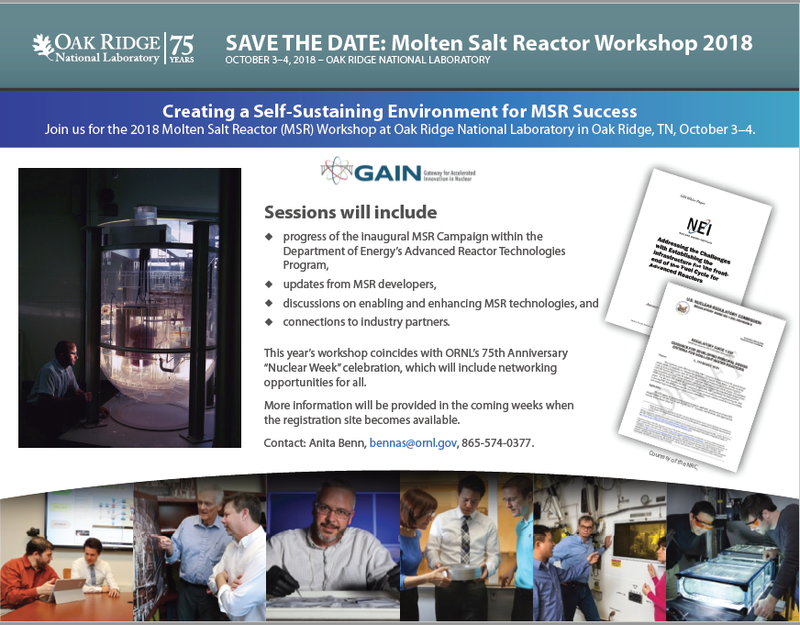 Wednesday, October 3- Thursday, October 4: Oak Ridge National Laboratory (ORNL) will host the 4th Annual Molten Salt Reactor (MSR) Workshop. Held at ORNL, the theme this year is “Creating a Self-Supporting Economy of Ideas and Applications for MSRs.” Click here to register. Friday morning, October 5: Every Friday ETEC hosts an informative networking breakfast featuring speakers who share interesting and pertinent information about the community, science, technology, and special initiatives. To begin the final day of NOW, ETEC’s meeting will in conjunction with special nuclear security programming planned by the CNS team at the Y-12 Nuclear Security Complex in Zach Wamp Auditorium at New Hope Center. Afterwards a tour of Y-12 will be offered. Registration required for the tour and seating will be limited. Click here to register. Friday afternoon, October 5: Oak Ridge is pleased to host one of the Nuclear Millennial Caucuses in the Zach Wamp Auditorium of the New Hope Center at the Y-12 National Security Complex. This half day caucus is one in a series of events that bring together the next generation of leaders in nuclear innovation. Click here to register.